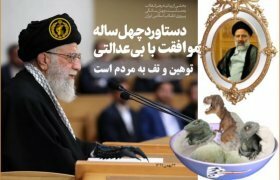 The Theocratic Leader of Iran, Ali Khamenei, like his predecessor, is a man who sits on high, Velayat-e Faqih, and tells all others what they must think and how they must act. This is an unacceptable state of affairs for people living in the twenty-first century. By allowing this to happen since the formation of the Islamic Republic in 1979, our elders have let down two generations. This is our Manifesto and our basic credo. In the Iranian Theocracy, there is no room for the women, young generation or minorities. Dictatorships, such as Velayat-e Faqih, stay in power because they are backed actively by some and unconsciously by others. This website and those behind it are not anti-religion but wish to highlight the brainwashing and damage to ordinary people by the theocratic leadership in Iran. We advocate a secular society with choice and freedom of speech for all. Iran can only boast its cultural greatness when, it can display a secure and free country for all. To achieve this, our country needs active, credible opposition to Velayat-e Faqih and the ayatollahs that focuses on the needs of our people. The corrupt, repressive system means that opposition can realistically only be conducted by Iranians living outside their country but, all too often, those doing this are preoccupied with petty squabbles and in-fighting. Please explore our pages and the Blog Posts, where you will find regular updates on what is happening in our country. You can also interact with the author and learn more about her motivations.